If Rex Tillerson is confirmed as Secretary of State, he will face a difficult and complex array of nuclear policy challenges. 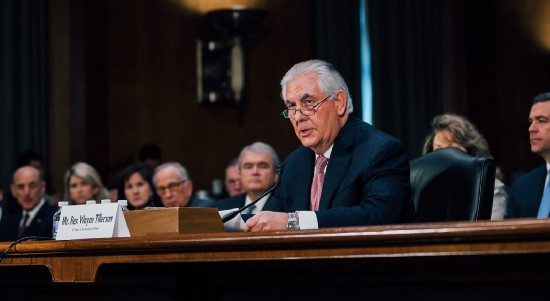 Tillerson provided some clarity on where he stands on several critical nuclear issues during his confirmation hearing in the Senate Foreign Relations Committee on Jan. 11. While some of his answers reinforced longstanding, bipartisan nuclear risk reduction goals, significant questions remain about how the Trump administration’s plans to address critical issues—ranging from curtailing North Korea’s rapidly advancing nuclear program, to reducing the risk of conflict with Russia and strengthening strategic stability, to enforcing the nuclear deal with Iran. On two key areas Tillerson’s views reflected continuity with current U.S. policy on arms control and nonproliferation and responsibly differed from some of president-elect Donald Trump’s past statements. For example, Tillerson clearly and unambiguously voiced his disagreement with past suggestions from Trump that it would be in the U.S. interest for Japan, South Korea, and Saudi Arabia to possess nuclear weapons. Tillerson also expressed his support for the New Strategic Arms Reduction Treaty (New START) and continued engagement with Russia and other nuclear-armed countries on seeking further verifiable reductions of nuclear weapons stockpiles. The United States is obligated to pursue negotiations on disarmement under the 1968 Nuclear Nonproliferation treaty. This appears to diverge from Trump’s suggestion via Twitter that the United States must greatly strengthen and expand U.S. nuclear capabilities and reported comment that he would “outmatch” and “outlast” other potential competitors in a nuclear arms race. Asked about the Trump tweet and arms race comment, Tillerson did not call for increasing the number or role of nuclear weapons in U.S. policy, but stated that the United States must “from time to time” upgrade its nuclear arsenal to ensure a position of strengthen in future negotiations. While Tillerson did not provide details on how the new administration would seek to advance further arms control measures, his commitment to continue engagement in this area is a positive step. Of the nuclear issues discussed during the hearing, North Korea consumed the most time. Tillerson clearly recognized the threat posed by North Korea’s advancing nuclear programs and the need for U.S. engagement on this issue. He acknowledged that the United States should have realistic expectations about the role China will play resolving the North Korean nuclear crisis and that the consequences of actions such as shooting down North Korean ballistic missiles after test launches should be carefully considered before being pursued. Tillerson emphasized the need for better sanctions enforcement, particularly in China, and coordination with allies. However, he did not articulate a clear strategy for halting the growing nuclear dangers posed by Pyongyang and it remains unclear how the new administration will seek to curtail the threat. Tillerson’s position on the nuclear deal that the United States and its partners negotiated with Iran leaves cause for concern. Unlike several of Trump’s advisors, Tillerson did not call for Washington to tear up the deal and acknowledged that it denies Iran the ability to develop nuclear weapons. Tillerson said his recommendations for the president, which he said are consistent with Trump’s thinking, would be to fully review the agreement, examine Iran’s compliance record, and ensure strict enforcement of the deal. He did identify that building on the Iran agreement, especially after some of the key limits expire, is important, but his response on what that should entail—no uranium enrichment, no nuclear materials stored in Iran—is unrealistic and a nonstarter for building on the agreement. More practical options that the Trump administration should consider are negotiating extensions of some of the key restrictions that expire. Key questions for the Tillerson and the Trump administration that remained unanswered are whether the State Department will retain the office dedicated to overseeing the Iran deal and continue to waive U.S. sanctions as required under the agreement. Tillerson also was not questioned about the risks of trying to renegotiate the agreement, which Trump has declared an interest in doing. Below are some of the key quotes from Tillerson on nuclear issues. These are organized thematically and may not appear in chronological order. When necessary, the question is included to give context for Tillerson’s responses. Senator Jeanne SHAHEEN: “More broadly, do you support the long-standing bipartisan policy of engaging with Russia and other nuclear arms states to verifiably reduce nuclear stockpiles? Tillerson’s comments expressed an opposition to nuclear proliferation. Senator Ed MARKEY: Mr. Tillerson, do you agree with President-elect Trump when he said, quote, "it wouldn't be a bad thing for us if Japan, South Korea, Saudi Arabia acquired nuclear weapons?" TILLERSON: Senator, I don't think anyone advocates for more nuclear weapons on the planet. MARKEY: Donald trump said it would not be a bad thing. Do you agree with that or disagree with that? TILLERSON: I do not agree. MARKEY: You do not agree. Would you commit to working vigorously to ensure that no additional country on the planet obtains a nuclear weapons capacity? TILLERSON: Senator, I think if confirmed, it a vital -- one of the vital roles of the state department to play in working in the national Security Council in an interagency way has to be the pursuit of the nuclear nonproliferation. We just simply cannot back away from our commitment to see a reduction in the number of these weapons on the planet. Of the nuclear issues addressed in the hearing, North Korea received the most attention. Tillerson made clear that strengthening sanctions enforcement and Chinese compliance with existing measures would be a key tactic. Senator Cory GARDNER: And how do you intend lead U.S. in multilateral efforts -- multinational efforts -- multilateral efforts to peacefully disarm Pyongyang? TILLERSON: It's going to be a -- I think a long-term plan and it starts with, again, designing the sanctions and enforcing the sanctions to close gaps that exist, and - and you've already highlighted. That there are gaps in those sanctions today that are undermining their effectiveness. So, it is a question of closing those gaps where it's appropriate to seek further steps against those who are not fully complying with those sanctions and revisiting are there other ways in other areas where we can close off access by North Korean to resources that allow them to continue to develop their nuclear capabilities. It's - it's in all of the - looking at all of that approach as to what - what is still there, what can we put - how can we put additional pressure on them to deny them the capability to continue to advance not just the development but the delivery systems, which is where the greatest threat exist today. Senator Chris MURPHY: Meaning -- well my question wasn't in the context of the U.N., but in the context of whether the U.S. should lay down a line and respond if it's crossed because our security is more and more endangered as the range gets longer. I take your answer to be one way of saying no, there's probably nothing we can do? TILLERSON: No. You shouldn't take my answer in that regard at all. We need to work closely with our allies in the area, Japan, South Korea in particular, because anything we do will have a -- will certainly have a profound impact on them. And it all -- anything that we might consider, and what all of our alternatives might be would require a careful conversation at the National Security Council in terms of our capabilities, which we certainly have the capabilities to bring a missile test down. But how and what might be the consequences of that would require careful thought. So I'm not rejecting that as an option. I'm just not prepared to sign up for it today. “With respect to the recent agreement to limit Iran's ability to advance or make progress toward development of nuclear weapons, if confirmed my recommendations and I think this is consistent with the president-elect is now, is to do a full review of that agreement as well as any number of side agreements that I understand are part of that agreement. Examine what -- you know, whether Iran and our ability to verify whether Iran is meeting its obligations under the agreement and insure that we are enforcing all of the mechanisms available that hold them to that agreement. No one disagrees with the ultimate objective that Iran cannot have a nuclear weapon. The current agreement does freeze their ability to progress but it does not ultimately deny them the ability to have a nuclear weapon. My understanding is the current agreement for instance does not deny them the ability to purchase a nuclear weapon. It just means, it just denies them the ability to develop one. So I think there are additional areas that have to be considered. And most importantly if we choose to use this agreement as a way to provide an opportunity to discuss what comes next, because the real important question is what comes at the end of this agreement? And what comes at the end of this agreement must be a mechanism that does in fact deny Iran the ability to develop a nuclear weapon and that means, no uranium enrichment in Iran, no nuclear materials stored in Iran. Senator, if I could correct for the record, I misspoke. And during the break, I went and checked my source for that and confirmed that I misspoke, and that in fact, their commitment to the nuclear Nonproliferation Treaty -- the language that was in there about "acquire" some people quibble over, but -- but their commitment to the NPT was clear and I misspoke in that regard. Tillerson’s correction is accurate. Iran, as a party to the NPT, is prohibited in perpetuity from buying a nuclear weapon. In the nuclear deal, Iran reaffirmed that commitment. It is impossible in a day-long hearing to cover the full array of foreign policy challenges that the next Secretary of State will face. However, several nuclear issues were not mentioned that the Secretary of State will need to address. One issue that did not come up in the hearing was the future of the Intermediate Nuclear Forces Treaty (INF). The United States has accused Russia of violating the agreement and high-level political and lower-level technical consultations over the violation have yet to resolve the impasse. The INF Treaty is in Washington’s best interest and the next administration should remain committed to U.S. obligations under the treaty and to seeking a resolution to compliance concerns. For more on the resolving the INF Treaty Dispute, see the Arms Control Association’s issue brief, available online here. The expanding nuclear arsenals of India and Pakistan is also a concern. Both countries continue to produce fissile material for nuclear weapons and develop new delivery systems. In the past month India tested in Agni-5 ballistic missile, which is likely an intercontinental ballistic missile, and Pakistan says conducted its first test of the Barbur-3, the country’s first submarine launched ballistic missile. For more on U.S. options to reduce nuclear dangers in South Asia see the Arms Control Association’s analysis, available online here.